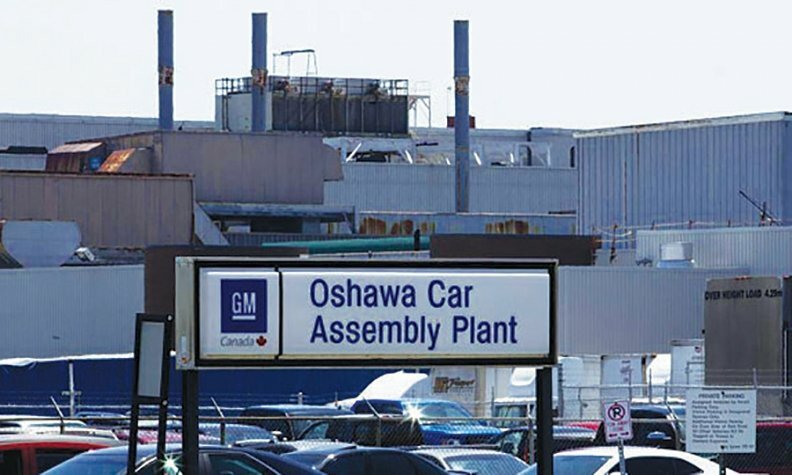 GM changes at its Oshawa, Ont., plant will have what it calls a neutral employment impact. General Motors will temporarily lay off workers at its Oshawa, Ont., assembly plant as the company adjusts production to address a weakening North American car market. GM Canada spokeswoman Jennifer Wright said workers at the plant, which builds the Chevrolet Impala and Cadillac XTS, have been told of the layoff but would not confirm its timing or how many workers are being laid off. Wright told The Canadian Press the change will have a "neutral employment impact" at the assembly plant. An assembly line that once produced the Chevrolet Equinox overflow that a plant in Ingersoll, Ont., couldn’t handle is being repurposed to build a truck. The type of truck won't be revealed until January when production begins. Wright said the move is partly the result of declining car demand in North America and particularly in the United States, where sedans are largely being shunned in favour of crossovers and pickups. “As we respond to general softening in the U.S. car market, we’ve had to make some adjustments,” Wright said. Car sales in the United States and Canada have slipped in recent years as consumers flock to crossovers and other light-truck offerings. American car sales were down 11 per cent year-over-year to 5.15 million units through October, while Canadian car sales dipped 2.7 per cent to 564,368 units during the same timespan. American XTS sales fell 20 per cent to 13,113 units during that time, while Impala sales were down 27 per cent to 58,306 units. News of the temporary layoffs came as GM announced November sales figures in the United States and Canada. The company’s November sales in the U.S. fell 2.9 per cent in November from a year earlier due to a steep drop in car sales, while Canadian sales plummeted 17 per cent. During labour negotiations with Unifor last year, GM committed to invest $400 million in the Oshawa plant over the life of a four-year contract. Much of that investment would go toward refurbishing one of the plant’s two assembly lines to assemble pickup trucks. “The plant is going through a transition as we prepare it to build trucks,” Wright said. She would not confirm when the plant would begin truck assembly or what model the plant would build. The plant is expected next year to begin final assembly on pickup frames shipped from Fort Wayne, Ind., which builds the Chevrolet Silverado and GMC Sierra. Unifor Local 222 President Colin James said in a July interview with Automotive News Canada that a pickup “shuttle” program will see shells of the two truck models shipped from Fort Wayne, Ind., to Oshawa for final assembly. James did not immediately return a voicemail seeking comment on the layoffs. Local 222 represents workers at the plant. At the time, labour officials praised the 2016 investment commitment as one that could give workers stability, especially as GM shifted production of its hot-selling Chevrolet Equinox crossover out of the plant.